Tom Milner has over 40 years of experience in the racing industry. 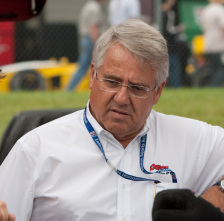 Tom has developed successful programs in a wide variety of racing venues, including IMSA, SCCA, NASCAR and Grand-Am. Early accomplishments include a partnership with Bill Scott Racing that produced 10 Formula Vee, SUper Vee and Formula Ford championships from 1964-1984. PTG's first IMSA success was in 1981, when the team campaigned a Ford Mustang to two Camel GT wins. The teams first full season in the GTP division came in 1991 where it raced a Chevrolet Spice, finishing in the top-ten in every race but two, capping the most successful independent effort in the history of IMSA GTP history. In 1992 the team fielded two Chevrolet Spice GTP's, scoring a number of top-fives with drivers Wayne Taylor, AL Unser Jr., John Paul Jr., Francois Migault and Jeff Purner. In 1994, PTG entered into the NASCAR Busch Grand National Series, scoring a pair of top ten finishes. In 1995, PTG was contracted by BMW North America as BMW's primary U.S. motorsports research and development team for the BMW M3. BMW and PTG remained partners until 2006. In 2007 PTG made the switch to taking over 2 Panoz Esperantes that were already in competition. PTG raced the Esperante through 2009, at which time we began the building and testing of the Abruzzi Spirit of Le Mans, which has brought us to 2011.